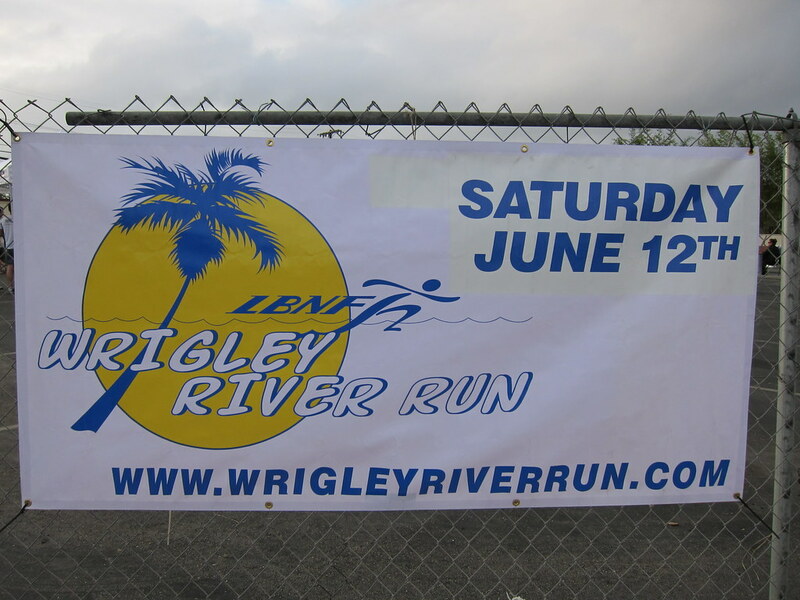 The Green Girl did the Wrigley River Run 5k this morning. All the proceeds from this race go to the Long Beach Neighborhood Foundation (LBNF) to support programs for at-risk city youth. A couple of the Sole Runners are members of LBNF. 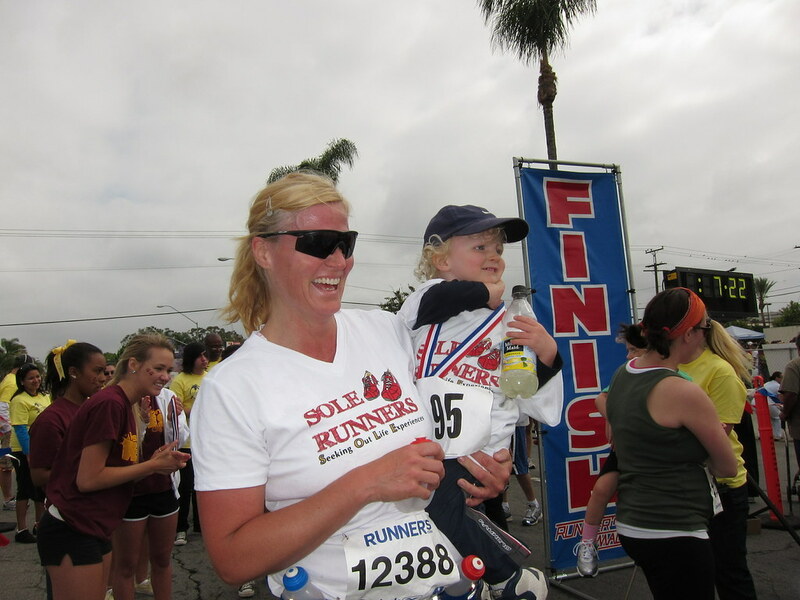 Since this was a local event, there were a lot of Sole Runners participating in the race. 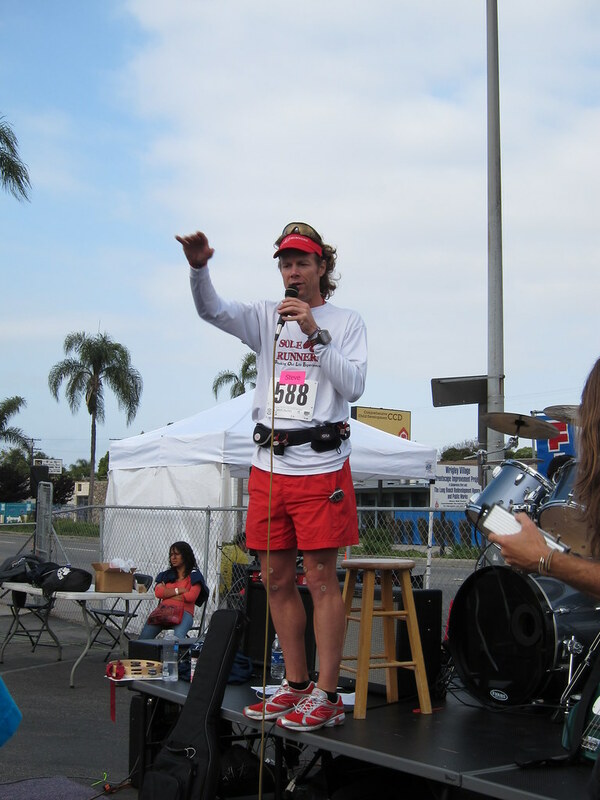 The Sole Runners coach, Steve Mackel, gave a free ChiRunning workshop. My friend, Candy, offered free massages at her Beauty & Wellness Day Spa booth. Phiten was taping up athletes with their titanium products. Road Runner Sports conducted Shoe Dog shoe fittings. Averyboo Arts also sponsored a bounce house for the kids. Wilson High School cheerleaders were also on hand to show their support along the course. It was really good to see Penny. She introduced me to her son and his girlfriend who were also participating in the 5k. I've seen her at few races but we had met for the first time at last year's Wrigley River Run. I was looking for Glenn, but Penny reminded me he had his son's graduation to attend this weekend. I was thrilled with the cool temperature as the race started. Unfortunately, I went out a little faster than I should have and I had to stop for my first walk break just past the halfway point. It also warmed up and the humidity kicked in. I tried to dig deep but I got really tired the last mile. It really helped me when Penny helped run me in. I cannot remember the last time I pushed myself that hard. After the Finish Line, there were plenty of bagels and bananas along with lots of water. Buono was also serving fresh pizza slices and handing out coupons in tiny pizza boxes. The Tadpole run followed and I spotted a tiny Sole Runner crossing the Finish Line. I did the 10K last year, and would have done it this year *except* not only was my son graduating, but it was also my wife's birthday. Don't think this one would have gone over well on the home front. In fact - didn't we meet last year at this race? If I remember (always questionable in my advanced age) Penny introduced me to you and Rad Runner? Yup, we met both of you for the first time at the Wrigley run last year. Awesome job!!! I know how you felt-I felt the humidity as well! Of course I'm sure we would both die in the south!!! Great job!!!! As always fantastic seeing you! Look forward to seeing you this thursday!!! Seems like everyone had lots of fun. Great pics! Always nice to run a race where the proceeds are donated. Penny, I always say if I lived in some insanely hot and humid climate, there's no way I'd be a runner. I'd have to find another form of exercise because I wouldn't want to spend my life on a treadmill inside an air-conditioned facility. Johann, yes, it always feels good to know your registration fees are going towards a good cause. Sorry it warmed up, but it sounds like a fun time regardless! The sun was a tricky thing both Sat. and Sun! I really look forward to our totally speratic run this Thursday! Sounds like a great time! Love the tadpole run - so cute!! !